CG Says: The 2019 Lincoln Navigator is little changed after last year’s redesign. Lincoln Co-Pilot 360 (including autonomous emergency braking, forward collision warning, blind-spot alert, lane-keep assist, driver alert system, and adaptive cruise control) is now standard on all models. 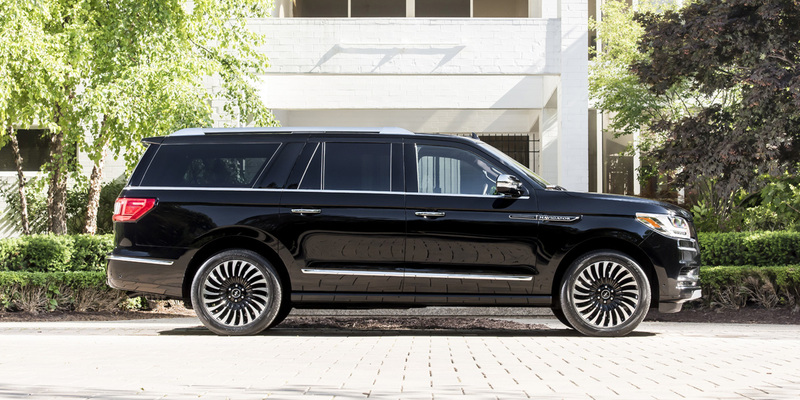 Like its Ford Expedition counterpart, the Lincoln Navigator full-size SUV was redesigned from the ground up for 2018. Chief among the improvements are weight-saving aluminum alloy body panels, a revised engine that puts out significantly more horsepower, a 10-speed automatic transmission in place of the previous 6-speed, a dazzling new interior, and a host of new technology features. As before, standard-length models and extended-length “L” models are available. The model lineup ascends through Base, Select, Reserve, and Black Label (the Base model is standard-length only). The sole engine on all is a twin-turbocharged 3.5-liter V6 that puts out 450 horsepower. As mentioned, a 10-speed automatic is now standard; the Reserve and line-topping Black Label trims come standard with all-wheel drive, and the others offer AWD or rear-wheel drive. Available features include 30-way adjustable “Perfect Position” heated/cooled/massaging front seats, panoramic sunroof, wireless device charging, adaptive cruise control with stop-and-go functionality, and specially-themed interiors in the Black Label edition. The redesigned Lincoln Navigator is a lot more expensive than its predecessor, but it’s also markedly more powerful, luxurious, and cutting-edge than before—and a much more compelling choice when compared against its similarly extravagant class rivals.